is it full strength? or 50%? where is the console chest from? where can I find those buffet lamps? Try the link below. Dimond has a similar style that is beautiful. We can ship anywhere in the US free freight. Wall Color - Can you please tell me what the wall color is? I recently painted my bedroom this color and love it! Any suggestions for carpet color? Trim and ceiling - Hi - What is the trim and ceiling color/finish, please? Valspar's Ultra White is a similar color. 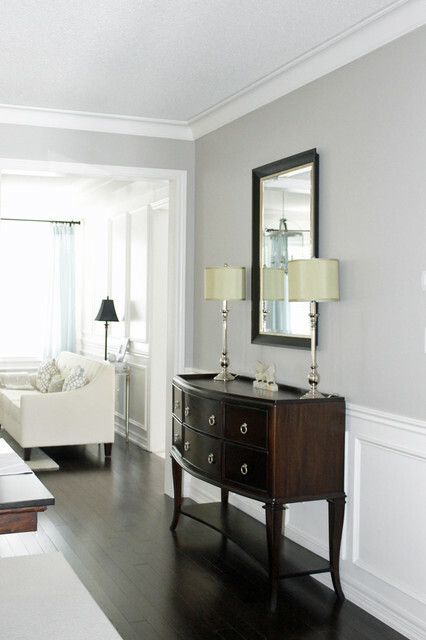 Typically, trim should be painted in a semi-gloss while ceilings should be painted with a flat finish. Would you paint ceiling and trim the same color or do 50pct lighter of the wall color? Color - What is the trim color? The trim color is a custom antique white. What is the floor color? Is this matte finish?or egg shell?tia! Where is the pretty sofa from? I like your aesthetic. Thank you. The sofa is custom made by Elite Custom Furniture in Toronto. The solid mahogany buffet is from Anne-Quinn Furniture Tribeca Loft ( http://www.anne-quinn.com/furniture/dining-sideboard-tribeca-loft/). What color gray is on the walls?